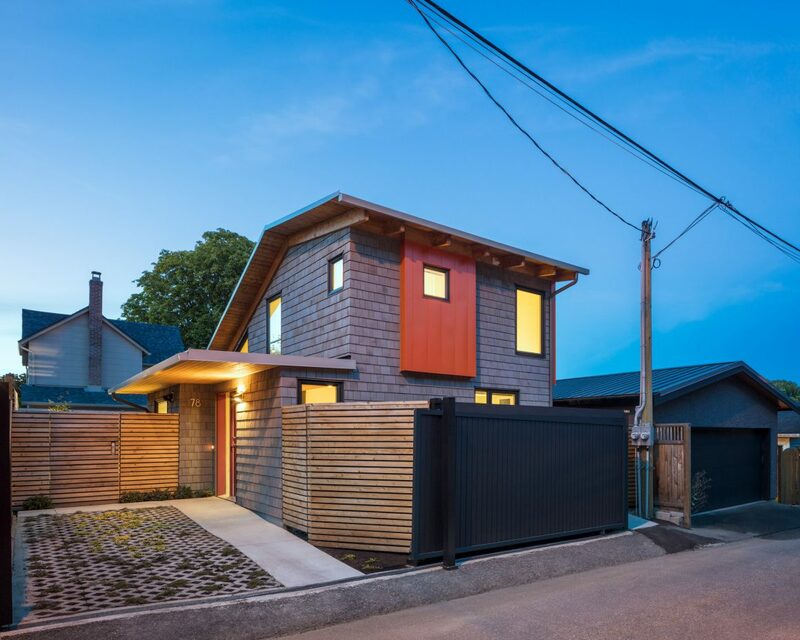 The newly built urban cottage presents a welcoming face to the laneway. The owners’ former, larger home behind was painted grey to complement it. 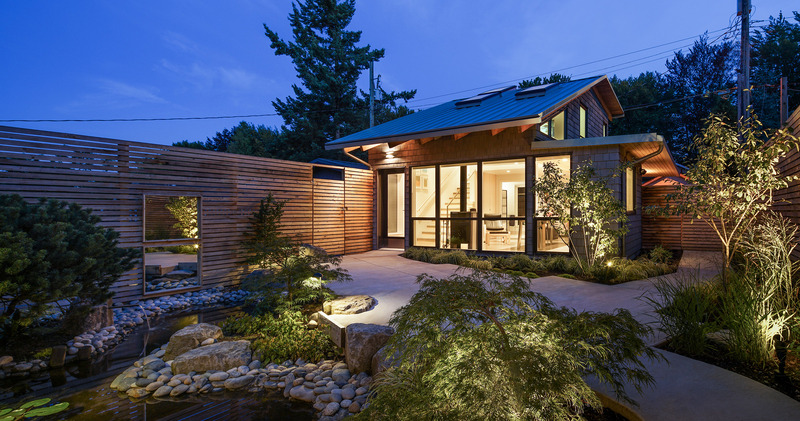 From the jaunty slant of the metal roof to the western red cedar shingles, this cottage exudes contemporary charm. But don’t look for it perched on a mountainside or overlooking a beach. It lies nestled off a laneway in the Elizabeth Park area of Vancouver. For a Scandinavian look, birch was used for the closet and staircase. A runner carpet, inlaid into the staircase treads, provides sure footing for the homeowner. Four modernist works by Canadian artist Kevin Drager hang over it. It was a very personal project for the homeowner. “He commissioned me to create a private paradise in the middle of the city and reclaim the garden,” says architect James Tuer, principal at JWT Architecture and Planning. The newly built home lies behind the back garden of a large Edwardian house, built in 1907. The owner, a university professor, and his wife had lived in the house for more than 40 years. When she suffered a stroke eight years ago, her husband became her primary caregiver. And the narrow stairs and cramped rooms became problematic for the wheelchair she now uses. The main floor is wheelchair-accessible and open to the back garden. 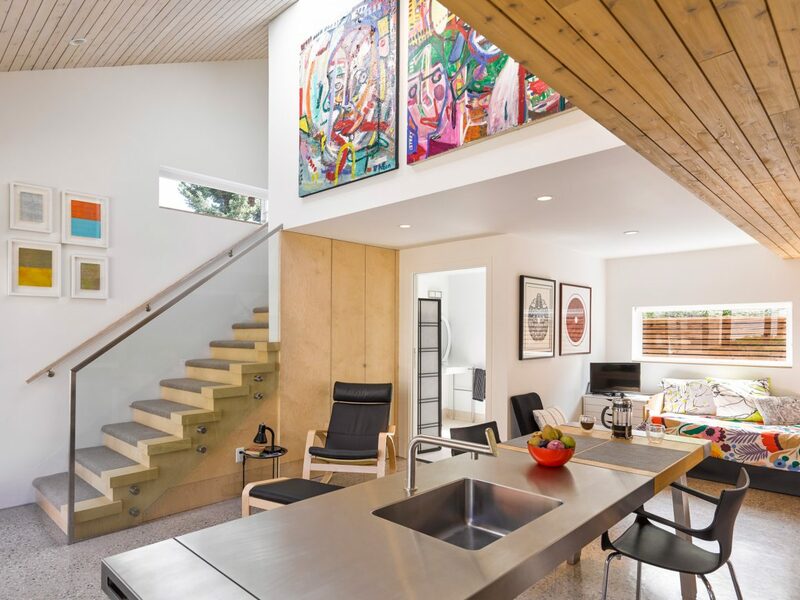 The architect took design cues from the owners’ kitchen island, the Bulthaup B2 Workbench, and art collection. Paintings: Vancouver artist Joel Libin. The focus on accessibility continues inside the home. Furniture was kept to a minimum on the main floor. A spacious bathroom off the great room includes a curb-less shower with resilient, wet room-worthy flooring. The staircase leading to the second floor was designed to accommodate a future chair lift if necessary. Among the practical details, baseboards throughout the home are of scuff-resistant MDF. Rich in architectural details, the great room is highly functional as well as pleasing to the eye. A daybed provides a place for the wife to sleep facing the large back garden. Placed in front of the patio doors, a freestanding gas stove takes the chill off winter evenings. The husband occupies the second-floor bedroom with ensuite bathroom at night. It was he who found the modern German-made Bulthaup kitchen island, from which the architect took his cues when laying out the space and choosing finishes. 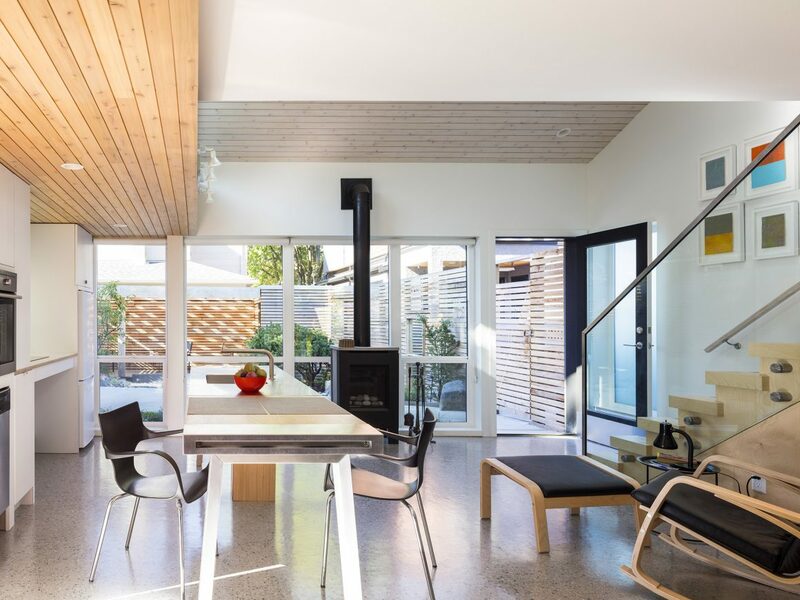 Since 2005, the architect’s primary focus on West Coast Contemporary architecture has come to embrace Scandinavian influences as well. 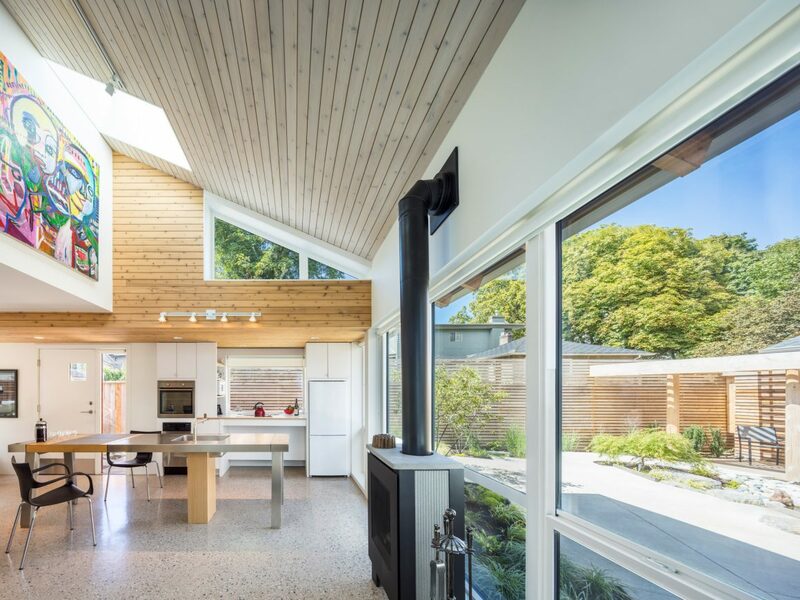 Like most of Tuer’s designs, this one was created to maximize the amount of natural daylight entering the home. 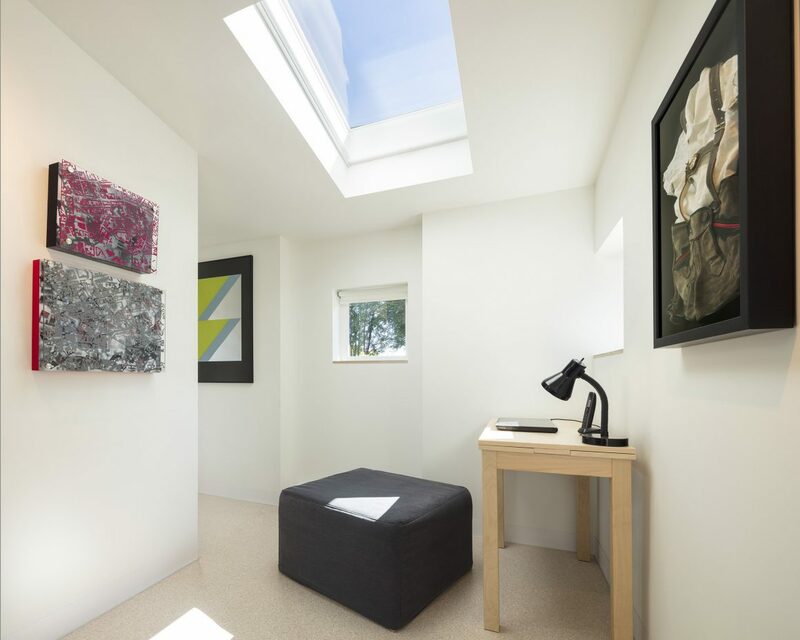 Four strategically placed skylights were installed. 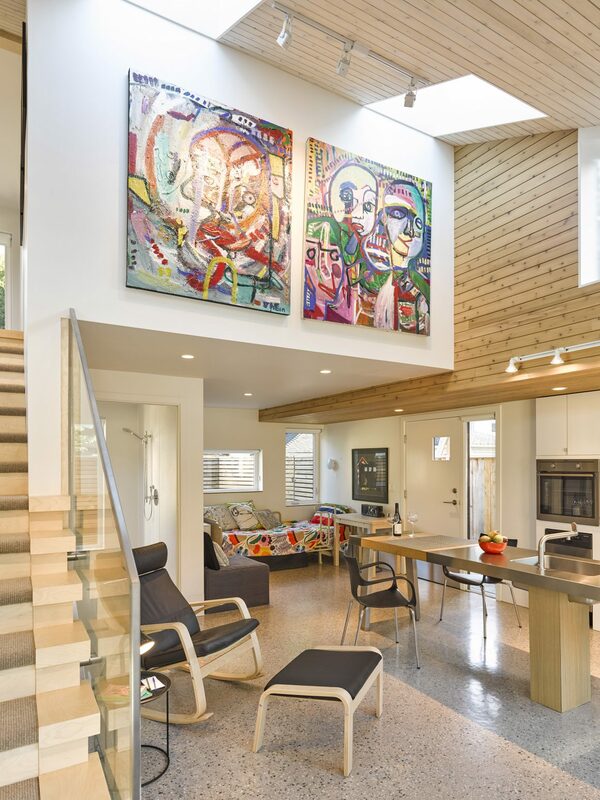 A tall wall seems to float above the great room, reflecting light that streams in through the floor-to-ceiling windows that face the back garden; it provides space to display works of art. 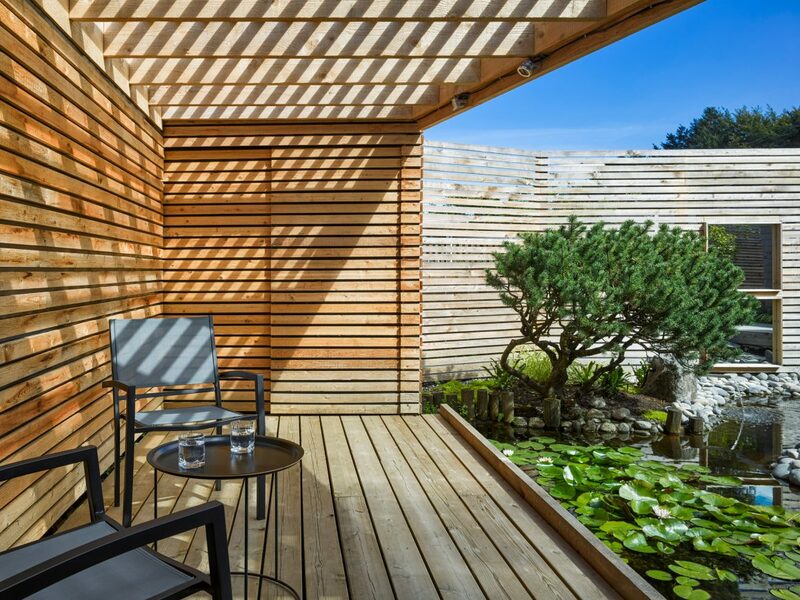 Echoing the fence that encircles the garden, the interior ceilings are of fine-line cedar, in some parts whitewashed to help define the area. The concrete floors resemble terrazzo and were chosen for their durability and natural ability to reflect light. Tuer, also a landscape architect who has worked on planning large-scale resort projects, redesigned the garden, which had become overgrown. 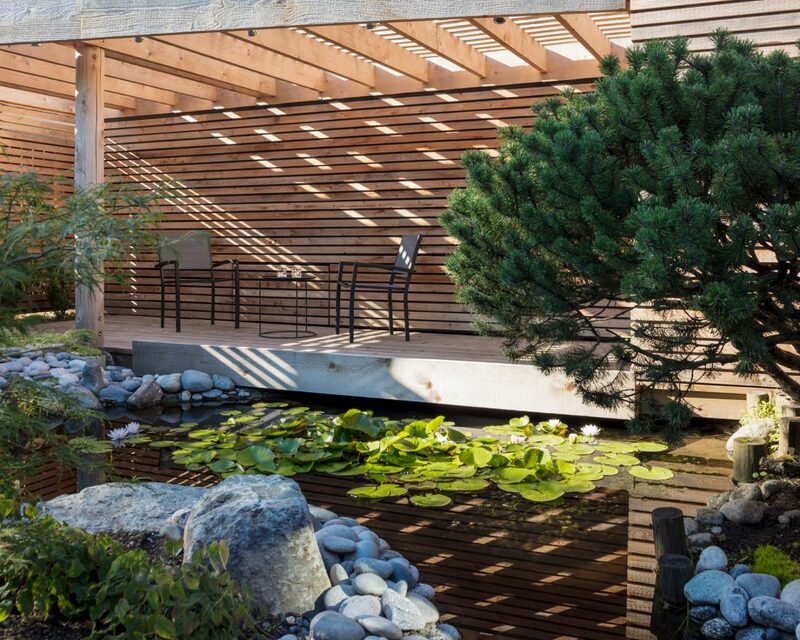 He was able to preserve the original pond, the koi within, and a pine tree. He also repurposed a gate from the old garden that was very important to the owner, who also owns fine-art prints by the gate’s designer, Vancouver artist Bodo Pfeifer. 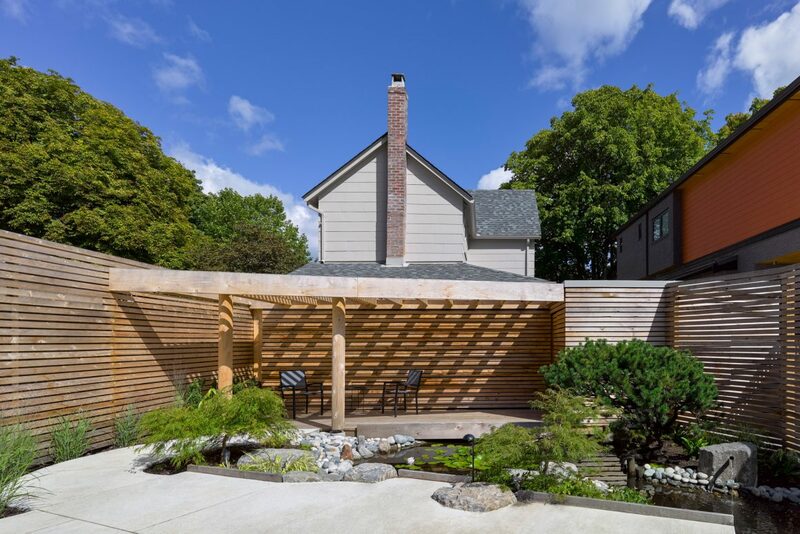 The garden was designed to be an outdoor room, in which cedar fencing and pergolas echo the home’s ceilings. Discreetly inset doors conceal recycling bins or lead to a safety exit lane. Tuer says it was important to create a seamless flow from inside the home to the garden. “With my landscape training, I’m always mindful of how people move through spaces and the kind of experiences they want there,” he says. 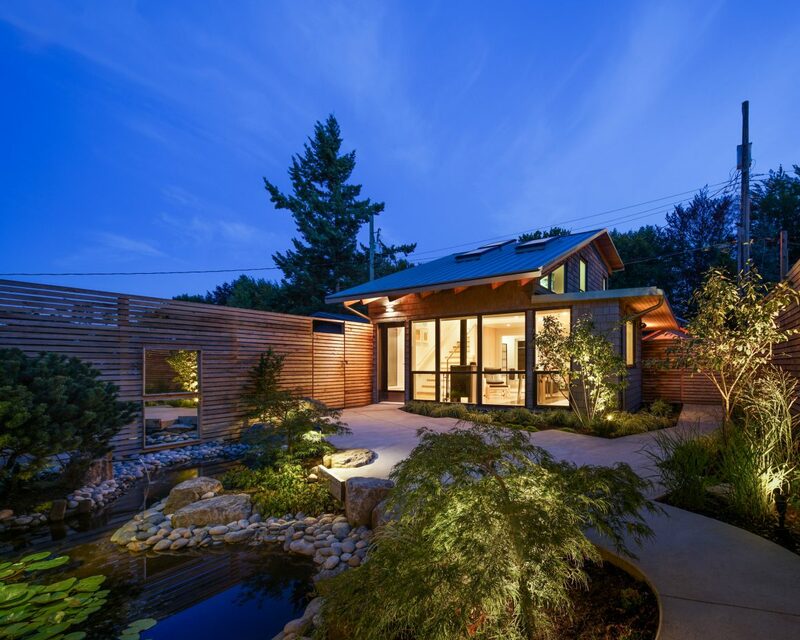 Artful use of hardscaping gave the garden’s design more urban edge. The use of low-maintenance grasses and plants keeps landscaping chores to a minimum. Concrete paths with safety curbs wend through the garden, leading to a pergola-covered area along the back fence.